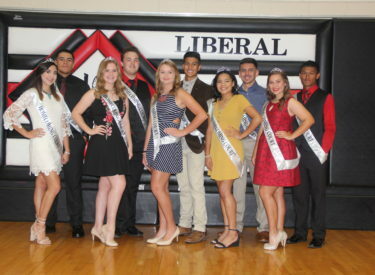 Liberal High School hosts homecoming Friday night at the Gary Cornelsen Sports Complex. The Redskins play Wichita East at 7. The fall homecoming king and queen will be announced during halftime of the game. The queen candidates are Shae Miller, Rebecca Irby, Alicyn Carey, Alondra Brito, and Hayley Parker. The king candidates are Saul Valles, Josh Diazdeleon, Javier Bojorquez, John Aung, and Arron Hardin. The homecoming parade begins at Light Park at 2:30 Friday afternoon as school lets out at 1:15 for the high school and middle schools and 1:30 for the elementary schools.